More than 700 people attended the free art and music festival, “#SchoolsNotPrison,” at Cal State San Bernardino to raise awareness on who California sends to prison, the cost of incarceration, and how that spending affects investments in education, health and other community needs. 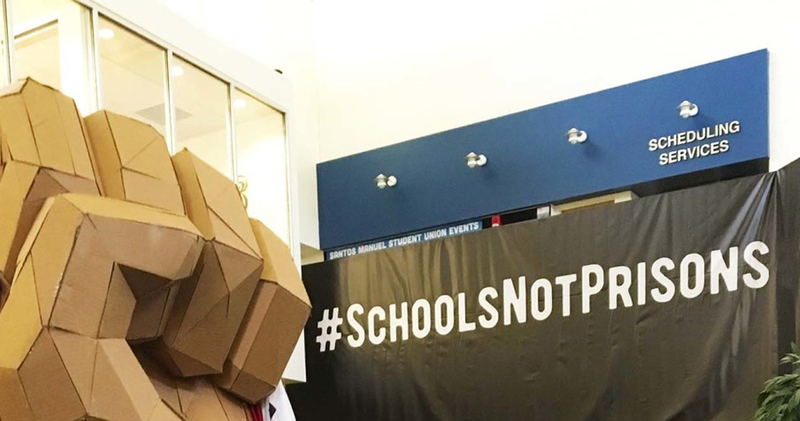 The second stop of the #SchoolsNotPrison 10-city tour consisted of spoken word, powerful speeches, and six different artists, including headliners Diggy Simmons and Audio Push., who performed at CSUSB’s Santos Manuel Student Union on Aug. 27. The event also featured artwork created by local artists that reflected social justice issues in the community.